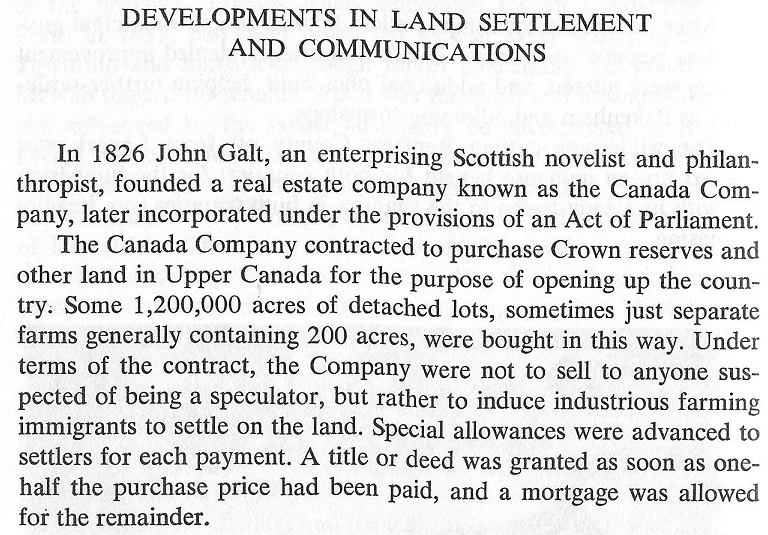 Upper Canada Land Grants etc. 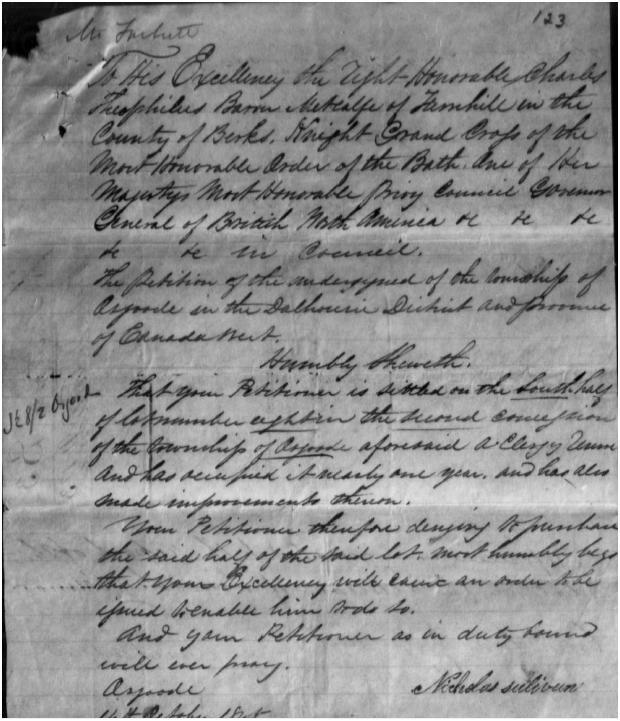 : Early Documents at canadiana.org and at Library and Archives Canada - Also the Canada Company Upper Canada Land Grants, etc. Get a coffee, set aside a half hour and follow some of Gaelynn's links! This doesn't relate specifically to Carleton County but may help some people. I've been creating an index to the early documents at canadiana.org. gov't, working in the canals, etc etc. a link to your page. There is a terrific amount of information included there. I just found my GGGrandfather who bought 200 acres of crown land in Gloucester in 1835. 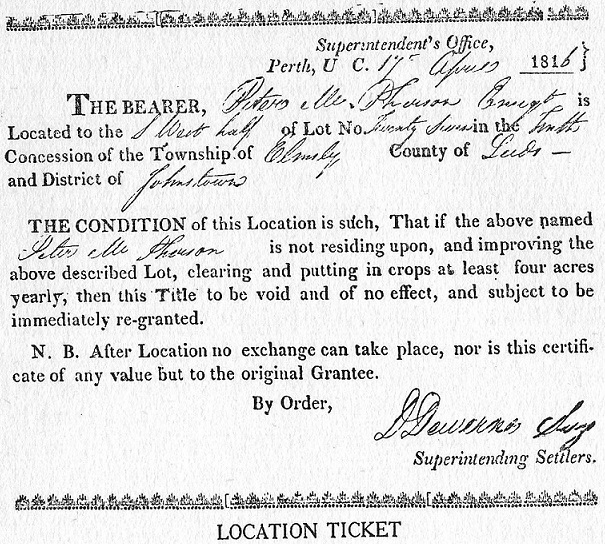 He (Lawrence Byrnes / Burns) bought land in concession 3 on June 24, 1835.
must have been the first farm. Amazing -- and there are lots of other familiar names. If you follow the links on her page you will be able to zoom in for easier reading. Source: A Pioneer History of the County of Lanark, by Jean S. McGill, page 110.
edited by Susan Smart, ISBN 978-0-7779-2154-8. It contains 87,795 names. so many more, so if you ever feel like talking about the old days, give me a call! from the start. So why are some like the McKenna, Quinlan and Larkin 200 acres? 3) Where was the Jockvale Post Office on the Clothier Property, at their farmhouse? they still raise cattle there. "The Kennedy Story" close enough to pay attention to whether this is "your" Kennedy. Thought you might be interested though. 6) I am very curious about how this area looked when the first settlers arrived. In other words: type of forest? Had it already been logged? Was it brush and forest? Any ideas where I could learn more? more too. I have spent hours comparing this and the 1879 map. I still plan on getting some 1940's arial photos soon, and will share them with you. I'm sending a copy of this to Michael Daley who is also interested in this. have a large map of Carleton County, dated 1863, 16 years before the 1879 Belden map. It's on the wall and is easy to get a good perspective. different farm sizes than in the later map. all 200 acres in size. The surveyors started from the rivers and moved inland. farmland stayed on their original lots. bought land from him in the 1850's. and land held by the Canada Company. More from Gaelynn Walls link. If you scroll down a bit in the "Settlers and  Land Grants"
or so and still be cheaper than what the crown was selling lots for -- a very tidy profit. explains why many of the original grants of 200 acres show up later as 100 acre holdings. Speculators could increase their profits even more by subdividng. For some time, the above records were unavailable at canadiana.org . Here is another sample of the material available through the links from Gaelynn's web site. Further information is posted on our William Brazill web page. Marrion (Mannion or Manion), Magee, Steen, Lighton, McLean, Kerr, Huston, Hartney & Anderson. 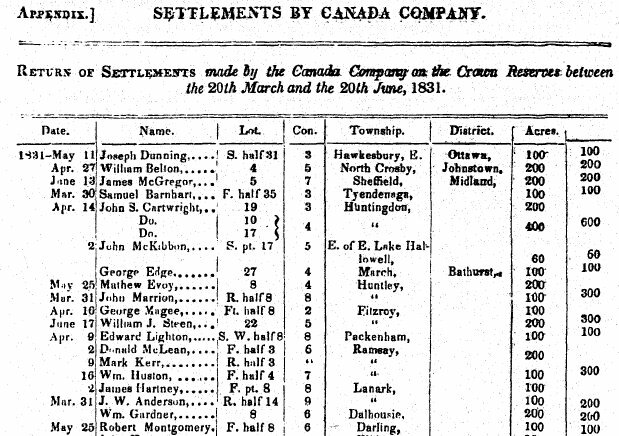 Library and Archives Canada has a searchable database for Upper Canada Land Petitions, 1763-1865. I guess this is a treasure trove of information which perhaps your fellow researchers have explored. the petition number subsequent pages lettered a, b, c and so on. Each roll contains in the order of 1000 - 1200 images; but with the bundle and petition and page numbers you can narrow down pretty quickly. Note: The National Institute for Genealogical Studies offers an interesting course on Land Petitions and Grants. Details:  Next Course begins February 6, 2012. Cost is US$ 89.00, lasts 8 weeks. All work done over the Internet. Hi Allan,  as I feared when Canadiana.org teamed up with Ancestry.com, most of these pages are no longer free. You can get a 15 day free trial, but after that you will have to pay. I'm going to leave the links up as some are still accessible. to new URLs. I am trying to sort those out also. While I think of it, here is a map of Southern Ontario in 1880, showing the names and locations of all the counties. was my Great Great Grandfather. He married Mary McGee and raised his family on Lot 8, Concession 2, Osgoode Township (Manotick Station Road). 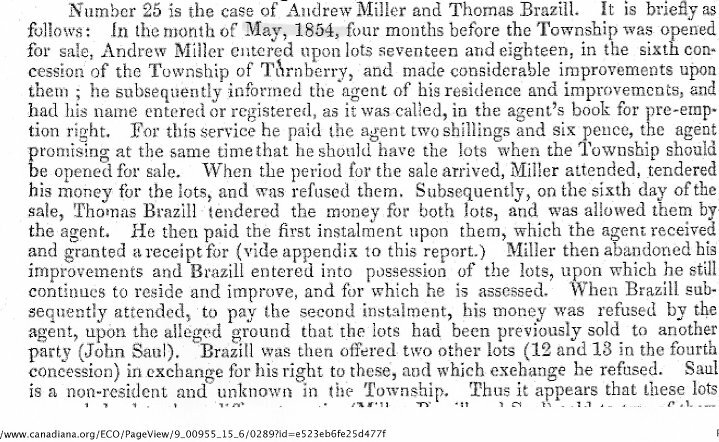 Al - check out reel # C-2824 pages 374-382 - I believe this is your ancestor - Concession 2, lot 8 Osgoode Township?? 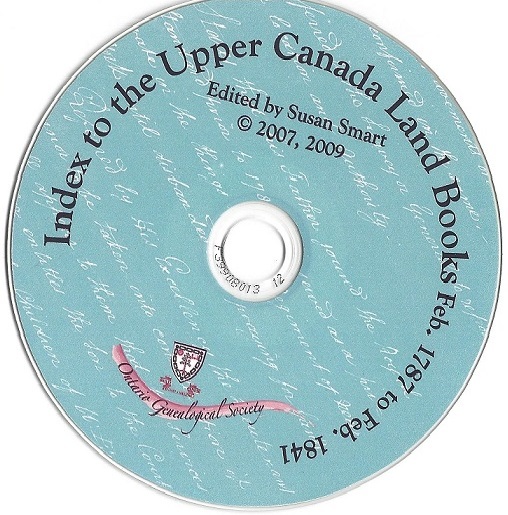 Note: Here is the Index to the Upper Canada Land Grants -- search it first to find a surname and the corresponding Microfilm Reel Number. Al and Mike - one thing I did when searching these Upper Canada Land Petitions is a search by location i.e. "Gloucester" , "Osgoode" etc. This is just the land petitions - (disputes). I am going to do the same searches today and see if I can print or forward the lists to you. I noticed "Dewar" in the Osgoode list - this must be the Dewan dispute you both spoke of on Friday. yet. They are provincial and are available at the Land Registry Office, 4th floor, Ottawa Court House, Elgin & Laurier. You can do your own searches ($8-$10 each) Mon-Fri 8:30-5:00. 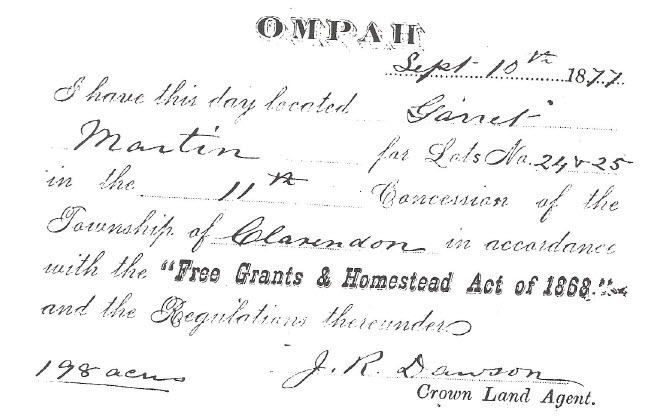 Here is an example of a free grant of land given to Mr. Garrett Martin in the Ompah area in 1877.
including much land given to the large number of settlers during the Irish Potato Famine in 1847. Map Source: Away and Back in Clarendon and Miller Townships, by C. A. Armstrong, 1991, page 20.